Louisiana’s shorelines are eroding at a drastic pace, some at rates up to 50 feet per year. 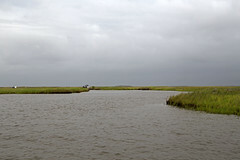 The fertile but fragile soils found in the wetlands are susceptible to wave energy. As land is lost, water bodies merge together, which can increase wave fetch and shoreline erosion. Behind these shorelines lie communities, highways, and infrastructure that are at risk of washing away. Various techniques to defend the coastline have been tested and applied under CWPPRA. Rock revetments, oyster reefs, concrete panels, and other fabricated materials have been constructed along otherwise unstable shorelines to abate wave energy and reduce erosion. These structures are designed to break waves, and they often trap waterborne sediments behind the structures that, over time, can become new land. Through the course of the CWPPRA program, advancements have been made in shoreline structures that have helped maintain natural processes while providing critical protection. Such advancements have included using lighter-weight materials that require less maintenance and can be constructed on organic sediments. Other advancements include low-relief structures that are designed to trap sediments and natural breakwaters such as reefs that can self-maintain and support other ecological functions. Other natural shoreline protection measures include vegetative plantings, whose roots help secure soils and can promote accretion. These projects are implemented with consideration for minimizing impacts to the surrounding environment. Although some shoreline structures may look foreign in a natural landscape, they are necessary features that physically protect communities and hold wetlands in place by mitigating the harsh forces that move to destroy them.